Are you among the growing number of pharmacists interested in increasing knowledge and earning a certification in antimicrobial stewardship? See limited offer by the KDHE HAI/AR program to provide reimbursement assistance to select candidates. The deadline to apply for this reimbursement program is March 1, 2019. Download information and application form here. Overuse and misuse of antibiotics is creating a major threat to public health: antibiotic resistance. We are all part of the problem—and the solution. Antibiotics only work on bacteria, not viruses that cause colds or flu. Taking an antibiotic when it’s not needed will not help you recover faster. However, doing so does contribute to antibiotic resistance. KDHE and KHC have developed a statewide campaign to spread the word about what patients and providers can do to help. We invite health care providers and the public to participate within their facilities and communities. Printed and laminated posters are available to interested PTN clinics and HIIN hospitals. For more information, contact Phil Cauthon at KHC: (785) 235-0763. Gov. 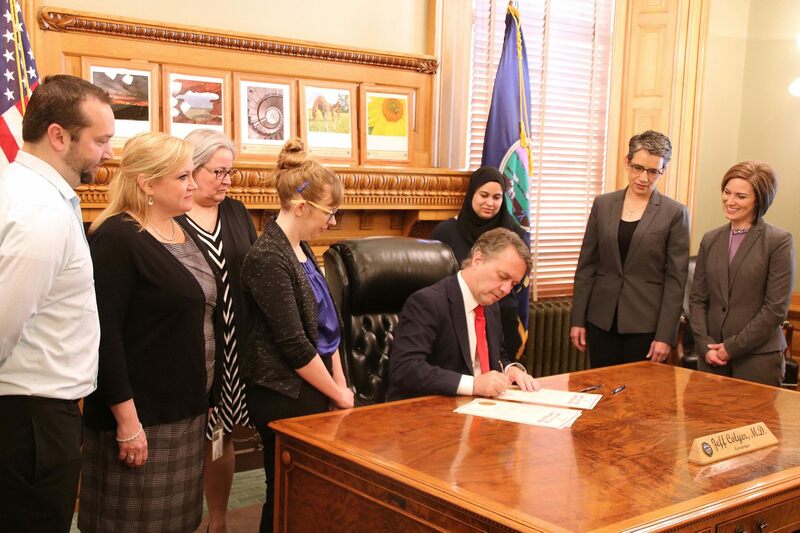 Jeff Colyer signs the "Use Antibiotics Wisely Week" proclamation for 2018, with partners from KDHE, KHC and the Kansas Foundation for Medical Care. Antibiotics save lives, but any time antibiotics are used, they can cause side effects and lead to antibiotic resistance. According to the Centers for Disease Control and Prevention, at least 47 million antibiotic prescriptions are unnecessarily given in doctors’ offices and emergency rooms across the U.S. each year, which makes improving antibiotic prescribing and use a national priority. The CDC also reports that drug-resistant bacteria cause 23,000 deaths and 2 million illnesses each year. 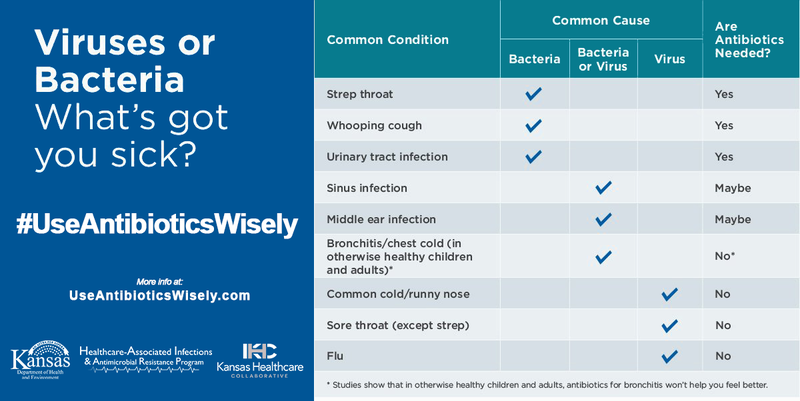 KHC is working with the Kansas Department of Health and Environment (KDHE) to advance its Healthcare-Associated Infections and Antimicrobial Resistance Program statewide. Antimicrobial Stewardship is also a patient safety focus area of the Hospital Improvement Innovation Network. A variety of learning opportunities and resources are available in support of efforts by hospitals, clinicians, and others who are leading this important work. KDHE and KHC hosted a one-day program-building workshop for Kansas hospital teams in Manhattan. Video of the sessions and handouts are available below. "Addressing Barriers in Antibiotic Stewardship Programs," a facilitated audience discussion. A facilitated audience discussion about the role of leadership, champions, pharmacy, data and how to implement an Antimicrobial Stewardship Program. "Implementing the 7 Core Elements of Antibiotic Stewardship Programs"
A facilitated hospital panel discussion about how different facilities are implementing their Antibiotic Stewardship Programs. Watch past Antibiotic Stewardship webinars conducted by the Health Research & Educational Trust Hospital Improvement Innovation Network (HRET HIIN). The Presidential Advisory Council on Combating Antibiotic-Resistance Bacteria (PACCARB) meets at least two times per year in Washington, D.C.
Poster: What is Delayed Prescribing?